The basic plan for the site called for creating three planting strips spanning the length of the building as well as rehabilitating a raised bed garden in the playground area. 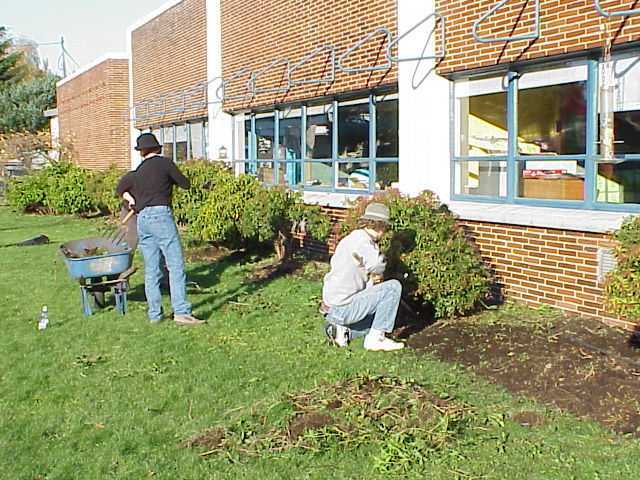 The planting strips were cleaned up by removing weeds and turf and pruning existing plants. After renovation, the Olympic Hills students helped the UW students plant the strips with a variety of spring-flowering bulbs. Long-term plans call for installing additional plants to create three small teaching gardens with interconnected themes. Members of the Olympic Hills community will add new plants as resources allow, using the design proposal created by the UW students. The three proposed planting area themes are: a water-wise garden containing hardy herbs and grasses with a Mediterranean theme, a winter garden with winter-blooming shrubs and perennials, and a garden of Puget Sound native species. In the playground area, a large planter box was rehabilitated and planted with bulbs for spring color; each year, parents and students will grow and install edible plants for enjoyment throughout the rest of the year. Finally, the UW students replaced the school’s John Stanford memorial tree, which was in decline. Below are photographs taken on our observational trip to Olympic Hills, followed by photos of our work parties and the final product. Click on any picture to see a larger version. A big thank you to the following individuals and organizations for your assistance with our project.